Call (800) 777-0202 or email us today to get a quote or request a sample of our Ladder Tread Grip. Frank Lowe offers die cut & kiss cut ladder tread grip tape to help you create more effective and safe products. We'll listen to your application needs and guide you to the best ladder tread grip solution. Frank Lowe's ladder tread grip tapes are designed to significantly enhance the safety on one of the most dangerous spaces on a ladder. Often a small surface for footing, the ladder rung can be a slick metal surface that requires the use of ladder tread grips. At Frank Lowe, we offer ladder tread grips in an array of materials for virtually every purpose. To make sure you choose the best material, we'll carefully listen to your needs and guide you to the optimum ladder tread grip. Continue reading to learn more about some of the most common ladder tread grips we use to help our customers. Our rubberized anti-skid ladder tread grip tape can be supplied either die cut or kiss cut on a roll. 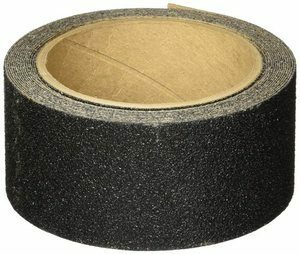 This tape is made up of small to large abrasive particles bonded by a tough polymer onto a dimensionally stable film. The 3M Safety Walk ladder tread grip tape is exceptionally easy to use and install. It's backed by a water and chemical-resistant, pressure-sensitive adhesive that allows it to stick to a vast range of surfaces. 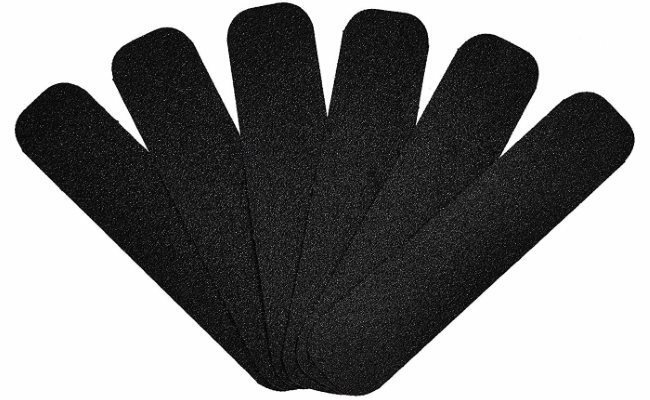 Each roll or strip of ladder tread grip tape is protected by an easily removable liner. By offering a range of different custom sizes, colors, and product series, we will help guide you to the best ladder tread grip tape based on the actual application of the ladder. For instance, the 3M Safety Walk Rubberized ladder tread grip tapes are softer, so they're typically more ideal for ladders that may be used by consumers and bare feet. 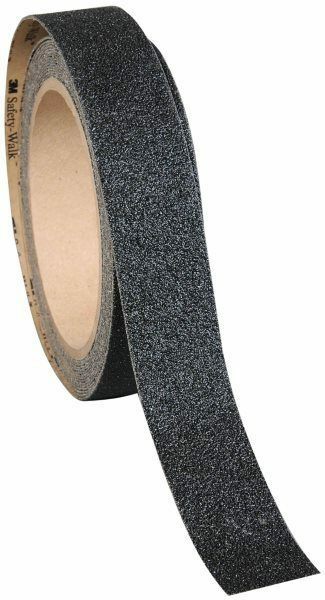 Offering a coarser, more sandpaper-like appearance, this tread grip tape is comprised of finer and more abrasive rubber particles that are bonded a dimensionally stable film. You can have this ladder tread grip tape provided either on a roll or in custom die cut strips. Each ladder tread grip tape is made from an extra reliable rubber compound that boasts durability and longevity. 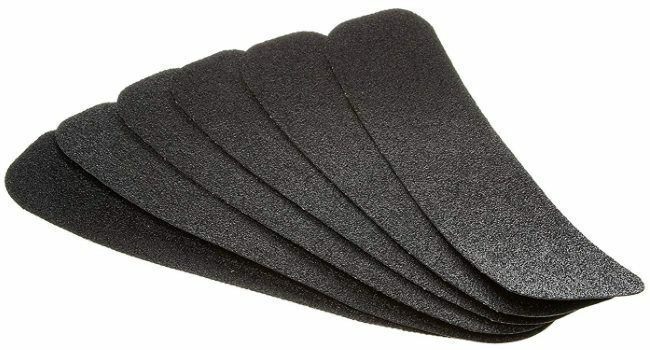 Because of the coarser and more abrasive rubber particles, this type of ladder tread grip tape is usually found in marine applications, such as loading dock ladders and similar applications. 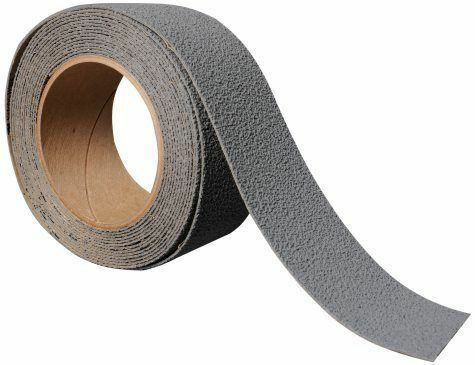 Frank Lowe's sandpaper-like ladder tread grip tapes are available in a range of colors, sizes, and series. However, all of our ladder tread grip tapes are backed by an easy-to-install water and chemical-resistant, pressure-sensitive adhesive that allows it to stick to virtually any surface. We understand how there are hardly ever any one-size-fits-all solutions when it comes to custom manufacturing. We offer a full range of custom manufacturing solutions designed to help you explore, pursue, and create more and better. We can die cut or kiss cut your ladder tread grip to your exact specifications. With kiss cutting, we'll cut through the actual ladder tread grip sheet of material while gently kissing the adhesive backing paper. By having your ladder tread grips kiss cut on a roll, it morphs into a peel-and-stick component that streamlines application. Whether you already know the exact specifications and type of ladder tread grip tape you need or if you only have a concept, it's never too early or late to partner with Frank Lowe. Contact us today to explore, pursue, and create with ladder tread grip tapes. Interested in Ladder Tread Grip? Fill out the form below to request a free quote! Are You Using Ladder Tread Grip For Your Product Application?